I never post sermons on my blog because, frankly, no one checks out a blog to read a sermon. 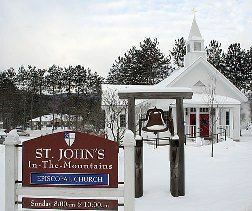 But I had so much fun preaching at the installation of my friend Rick Swanson as the new rector of St. John’s in the Mountains in Stowe, Vermont, that I decided to go against my unwritten rule. Plus, Rick likes to see his name in lights. Even if those lights are the ever-so-dim lights of my blog. I’d never been to Stowe and had barely ever stepped foot in Vermont. My first impression when I stepped out of the car in the midst of the quaint village was that the place smelled like cow manure. Literally. But that just added to the charm. And according to both Rick and Bryna we’re taking a family trip out there to ski in February. Who knew? It was a privilege to preach on such an occasion and it reminded me that close friends so enrich this whole journey of life. One of the great things about being a new rector, and I’ve had the experience twice now, is that for a short time people actually do believe you can walk on water. And I don’t know about Rick but I’ve never seen a need to dissuade anyone of this notion. That seems to happen soon enough all on its own. But the start of a new pastoral relationship is a heady time for both rector and congregation. Tremendous energy and enthusiasm pulsates throughout the community, the sense of hope and anticipation and excitement is tangible. You’d have to be half dead not to feel it this very night. The reality is that if you read any parish profile it quickly becomes clear what the parish seeks in a new rector – an excellent preacher, an able administrator, a compassionate pastor, an engaging teacher, a gifted writer, an active listener, an extroverted introvert with a knowledge of plumbing who never sleeps. In other words, they seek the Messiah. Now I’ve known Rick for many years; I went to seminary with Rick; he’s the godfather of my eldest son; we’ve prayed together and gone to Wrigley Field together; Rick taught a low churchman from the Diocese of Maryland how to swing a thurible and gradually nudged me up the candlestick in my personal piety. And there’s one thing you should know about Rick: he is not the Messiah (and, boy, have I always wanted to proclaim that from the pulpit). But if he’s not the Messiah, Rick is someone who is very clear about his identity – the baptismal covenant is at the core of his being. He understands that he is first and foremost a child of God. And he is a child of God because he, like all of us, has been washed in the water of baptism. It’s telling that the gospel chosen for this occasion is the baptism of Jesus. With his baptism at the hand of John in the River Jordan, Jesus’ public ministry begins. It is the start of something new; a recognition that things have changed; and an acknowledgment that Jesus has been called to a specific ministry of salvation. Baptism is for us, as it was for Jesus, a transformative moment in our lives. Of course most of us don’t have the slightest memory of the moment that our relationship with God in Christ was fully initiated through baptism. That’s what happens when we’re baptized as infants. But more important than remembering the specific event is that we live into our baptismal covenants throughout our lives. And that is ultimately what you have called Rick to do. To walk with you as you continually strive to live out your baptismal covenants in this place and in the world. Now you may well ask, “If Jesus was God’s son, why did he need to be baptized?” This is the sort of question that stops Sunday School teachers and priests dead in their tracks. I once received a phone call from a panicked Sunday School teacher who was asked this very question. Fortunately the teacher did the smart thing – she told the child it was an excellent question and that she’d discuss it the following week. In the meantime she started scrambling for the answer. Of course the next week the kid had no idea why she was even bringing up the topic. I’ve always seen the baptism of Jesus as not so much for Jesus but for us. The drama of the heavens opening and the dove descending are a public affirmation of what both God and Jesus already knew: that Jesus was God’s son. This was a clear sign to those who observed the baptism, and to us as well, that God was doing something new. It was a sign that a new age had dawned. And in this same way tonight’s Celebration of New Ministry isn’t as much for Rick alone as it is for the entire community of St. John’s in the Mountains. The gospel has, of course, been preached in this place for many years but tonight we mark a new leg on your continuing journey of life and faith. One that includes a new rector but one that doesn’t change the essentials of your witness to Jesus Christ here in the mountains of Vermont. And moving forward in ministry, your refrain as a community of faith must echo the responses of the baptismal covenant. 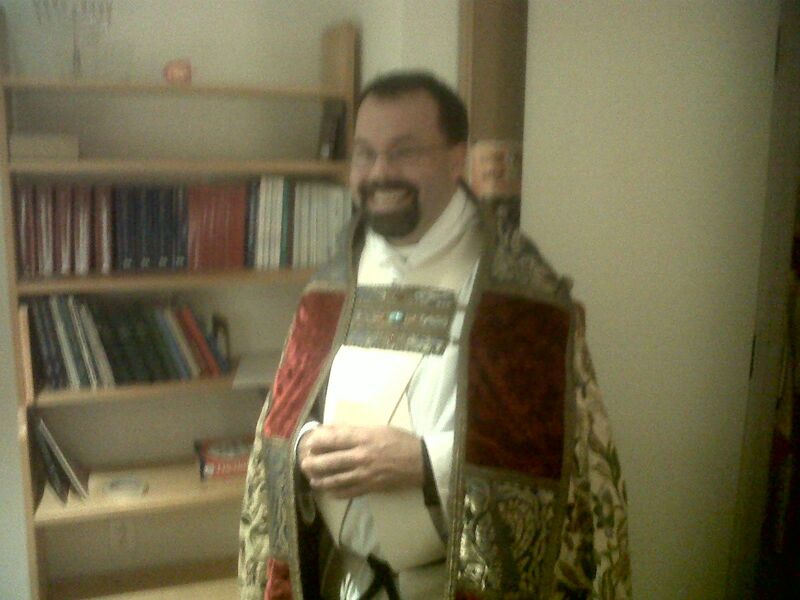 It must be “With God’s help.” Because you can have the greatest programs in the world; cutting edge, shiny new programs; and you can have the most cared for and tended to facilities in all of Christendom; and you can have the best liturgy in the Diocese of Vermont (and knowing Rick you soon will). But without God’s help none of it matters. It becomes busy work or empty ritual without the context of covenant with God. Without divine relationship the bones remain dry. As you enter into this new relationship, know that Rick will not just wade in the water with you; he’ll dive right into that deep well of baptismal relationship. He will seek not just to do ministry but to continually strive for transformation with and among you. So I apologize for letting you in on the secret that Rick isn’t actually the Messiah. But I do pray that this will be a fruitful pastoral relationship for many years to come. Rick does have an amazing array of gifts and you are blessed to have him among you as priest, pastor, friend, and fellow child of God. May you revel in this relationship and be drawn ever more deeply into the love of God in Christ Jesus our Lord.